2WAP is an international mobile entertainment portal with a wide range of services provided for the mobile users. Caramba.mobi - a very popular free public chat with 20 chatroom's and with more than 100 users online. Chat-Zone.mobi - a high end chat community with public and private chatroom's, user profiles, photos, friendly moderators etc. W8U.net - a mobile international dating community. Search for singles from your country, rate user profiles, add comments on photos etc. 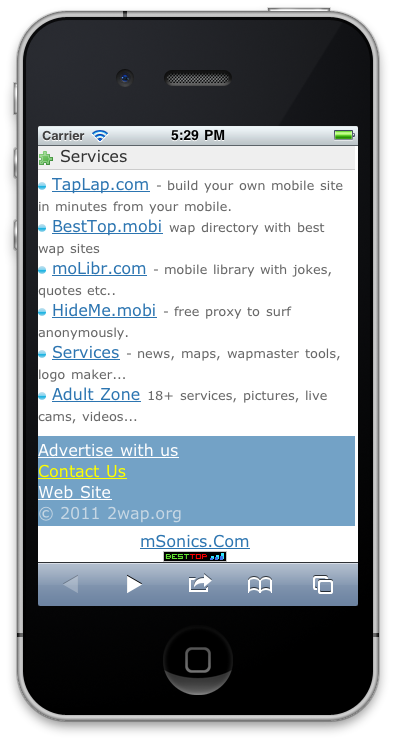 TapLap.com - mobile site-builder service where you can build a mobile site in just few minutes, in technical knowledge required. Xchanger.Mobi - mobile file-sharing service where you can upload your mobile content and share it with users. 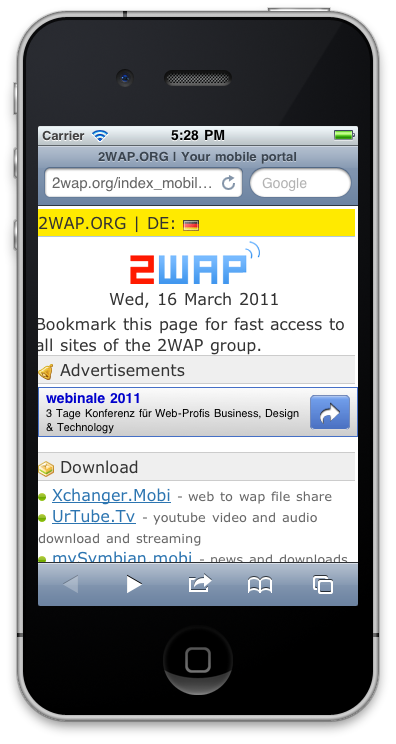 To enjoy all the mobile services of 2WAP please visit 2wap.org with your mobile device. Bluebell @ 2WapWorld: 2wap is a friendship chain. And each member make up the links. We chat we laugh and somtimes have a brawl. We share our opinions and our pain. We come from all parts of the world. We are all different but also the same. We teach we learn we compete we beat. We make special friends and regard them better than gold. Some leave the chain and others take there place. Every link has a name and are proudly displayed. In all colours and shapes to make ourselves known. This is our world, our place in cyberspace! To all friendships in the chain! SpArKo @ 2WapWorld: 2wap has the best fascilities over anyother site & i am saying this with proof! it is a peaceful place 2 spend time on.. i love 2wap & i am proud 2 be here! i went to so many sites but finaly i stuck here only.. cant find a better place than this ever! EAST OR WEST.. 2WAP IS THE BEST! vipul @ 2WapWorld: 2wap is..., A place wher i can feel free.., A place wher i can speak freely.., A place wher i can rest.., A place who give me peace.., A place wher i found someone spacial.., A place wher i found many good friends. A place wher i like to live long as possible. 2wap is like My 2nd home... Wher i live. OBELISKtheTORMENTOR @ 2WapWorld Blog: I used to be bored and alone, but thanks to GumSlone, i now have fun with my phone. With friends and a few foes, from 2WAP i will never go! In sickness and health, through wap, good and wap bad to be on Chatzone, i'm so glad! With chatters new and chatters old, 2WAP to me is gold! Through fights and fun, Chatzone, for me has always been #1! Mel @ 2WapWorld: To me 2wap is my space, a place i can go to 4 me time, 2 say hi 2 my buds from all over the world and i dont have 2 wait weeks 4 a letter a pm in just seconds. I can let go of myself and b whatever i wanna b. 2 learn bout others how they feel about stuff what we feel in S.A. This is my space, my world and my friends and i wont change it 4 da world.